Logistics depends on talented people from an array of backgrounds and generations. Thanks to UPS commercials, we’ll never forget the importance of logistics. But let’s be more specific and discuss the logistics manager — maybe the most important person in the entire supply chain. A logistics manager oversees the employees and projects that help deliver goods and services to consumers through a complex web of people, facilities and transportation. Hiring and retaining the right logistics manager is paramount. From having an in-depth knowledge of the advancements in supply chain management, to juggling numerous projects at the same time, to managing a workforce from various demographics, this position has a full plate. What is a multigenerational workforce? It’s actually exactly what it sounds like—a workforce comprised of employees from different generations. Today’s generations consist of the following (years can vary depending on source): Traditionalists (born 1925-1945), Baby Boomers (1946-1964), Generation X (1965-1980) and Generation Y (1981-2000). Why is managing a multigenerational workforce so demanding? Well, significant age ranges translate to significant ranges in attitudes, habits, opinions, preferred means of communication, personality traits, technological skills and more. In fact, this can the most daunting part of a logistic manager’s job. It’s challenging to bridge generational gaps, create a cohesive team and please everyone. WHAT IS THE “RIGHT” LOGISTICS MANAGER? A successful manager is an excellent communicator, experienced, organized, versatile and able to excel under the pressure of strict deadlines. Most important of all, they’re good with people in general—a people person. They recognize the differences between each generation and adjust their communication and management strategies to bring out the best in every individual. They also consistently remind everyone of how important they are to the end goal—to deliver the goods and services to the right place at the right time. To provide you additional insights on managing a multigenerational team, we recently interviewed a logistics manager who thrives in this environment. READY TO HIRE YOUR OWN GRANT? We have plenty of candidates that could be the ideal match for your business. 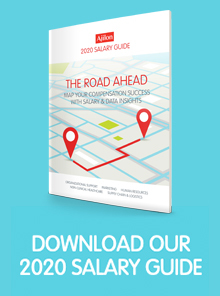 We also have a Salary Guide designed to fully prepare you to hire the best specialty talent. Get current job descriptions and salary ranges for logistics managers and countless other positions.